People from Si Yi (See Yep) emigrated to foreign countries as early as during the Tang and Zhong Dynasties, around one thousand years ago. In recent years, large proportion of emigration took place between the Opium War in 1844 and the founding of the People’s Republic of China in 1949. There were two peaks in migration figures; first was between 1840-1882 (The United States Congress passed a law to stop Chinese entering their country); second was between the end of the Second World War and the founding of the People’s Republic of China. In 1279, the south Zhong army fought the decisive battle with the Yuan (Mongolian) Army in the port county of Shenhue. Ten thousand Zhong army were killed. Around 30,000 defeated soldiers and their family fled to South East Asia. Amongst them were many people from the Si Yi (See Yep) region. After the fall of the Zhong Dynasty, farmers from these four counties who were supporters of the Zhong emperor continued to resist the Yuan army. In 1283, Kwai Fong Lam and dak Lai from Shenhue separately led this resistance. Eventually, after losing to the Yuan army, they escaped for their lives and left China, emigrated to South East Asia. 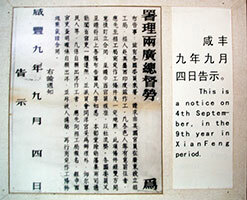 Ming Dynasty Government prohibited all sea traffic, until 1403, due to the desire for overseas trading. Merchants had to bribe port officials to open up the trading route via the seaports. Guangzhou in Guangdong province was one of China's main seaports, had it's own harbour master. Taishan had three temporary docks; Guanghai, Wangdong, and Qitan. Between 1405 to 1433, Zheng He explored the oceans eastwards and westwards seven times. He had sailed on the Pacific, and visited east and west Asia, including India, Persia, and east coast of Africa; totalling over thirty countries. At the middle of the Ming Dynasty, between 1442 to 1552 AD, peasants in the Wu Yi (Ng Yep meaning five counties) area uprose ten times. Each time losing many thousands of people. Many of the surviving defeated peasants left China and migrated to South East Asia. 1567-1572, Emperor Ming Mu Zhong lifted the sea traffic prohibition, when many Kaiping (Hoi Ping) merchants sailed oversea for trading. In 1553, the Portuguese used the excuse of using Macao to dry out their water damaged cargo, so they could occupy the area permanently. In the 16th Century, Portuguese, Spanish, Dutch, English and the French were fighting over the colonisation of Africa, America, Asia, and Australia. As these nations needed manpower to expand and develop their newly colonised lands, they traded slaves from Africa to work in America, then they turned to Eastern Asia for labourers. In 1519, The Portuguese kidnapped and tricked the Chinese to go to Portuguese colony of East India to work on their development. On three occasions in 1519, 1523 and 1556, the Portuguese went to Xinhui to buy slaves to go overseas. Around the same time, the Dutch also recruited Chinese labourers in Fujin, Guangdong. Then the recruitment became a large organised trade of 'kuli' based in Macao. As Macao is near Wu Yi, therefore, many Wu Yi people passed through Macao to sail overseas or being traded as slaves to travel abroad. During the early Qing Dynasty, Wu Yi peasants uprose against the Qing government in the hope to bring back the Ming government. Between 1645 and 1660, peasants from Xinhui, San Qeng, Ai Hai, and Lei Ju Min uprose. In 1647, Huang Ren Jeng from Xinhui's only hill (Ke San) along with Huang Jung Fu from Xinhui and Wang Qing from Xin Lin Wen village (Taishan) led the peasants uprising, with 100,000 fighters. When they were defeated, many escaped abroad by sea. From 1796 to 1820, Jeng Bo Zi from Xinhui Qia Lien recruited 200,000 conspirators for another uprising. They were beaten by the Qing government army. Most surrendered, but about 60,000 to 70,000 refused to surrender and most of these escaped by sea to sail to the Philippines, Bora Bora, and Malaysia to take up permanent residence. 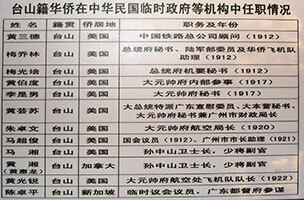 Many of these were from the Wu Yi region. According to historic records, up to the time of the Opium War, there were over one million overseas Chinese living in the South East Asia area. They were mainly from Fujian and Quishan. There were also many from the Wu Yi area. After losing the Opium War, the Qing Government gave Hong Kong to Britain as compensation. It became a trading seaport, and soon it established itself as a centre for the slave trade. 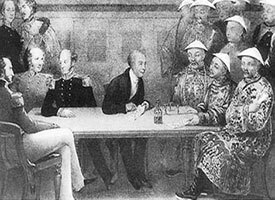 In 1860, Britain and France re-ignited the second Opium War, forcing the Qing Government in Beijing passing a regulation to relax the emmigration control. This allowed the legalisation of the slave trade. At that time, Wu Yi area was suffering from natural disaster, and together with the high rent and taxation, people found it very difficult to survive in such condition. In addition, the locals were fighting against bandits. In such circumstances they were being pushed into a corner, people had no alternative but to leave their hometowns to make a living abroad. This made them easy picking by the slave traders. In 1854, 100,000 people in Wu Yi joined the Jiangwei Red Neckerchief Army to uprise against the government. When they lost to the government soldiers, many escaped with their lives to overseas. In 1864, the Qing Dynasty came to an end after defeated by the uprising. 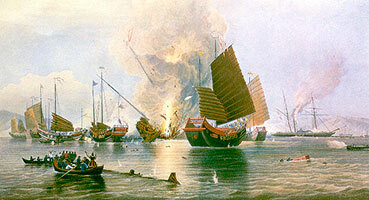 Huang Dechi from Xinhui took the defeated army oversea on many tens of ships. They arrived at Australia's Darwin, then most of them settled in Melbourne. The number of Chinese immigrants there reached many tens of thousands. From 1855 to 1867, people in Taishan area endured twelve years of fighting bandits. Almost 100,000 people left the area. Amongst them, around 30,000 were being exploited as slaves and transported to South America. Since 1848, gold was discovered in America, Canada and Australia. It was the beginning of the gold rush. Railway was needed to be built from the east coast to the west coast; Panama Canal was also being constructed. A large number of labourers were needed. They were mainly came from the South East Asia region including the 'contract workers' and slaves from the Wuyi area. As people were allow to migrate freely through the 'contract workers agents', migration reached another peak. 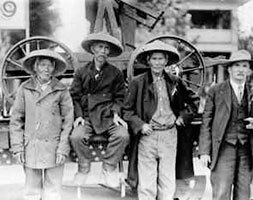 It was estimated from 1840 - 1876, Chinese migrant workers arrived in America reached 150,000 to 170,000. Amongst them were around 124,000 immigrants from Wuyi. The total Wuyi immigrants to Canada, Cuba, Peru, Australia and South East Asia countries was estimated at 200,000 during the same period. On 10th of October, 1911, Dr Sun Yet-Sen founded the Republic of China after he led the revolution which defeated the Qing Empire. Chinese immigrants around the world saw this could be an opportunity to return home to China for better prosperity. This did not last, as Yuen Sihui proclaimed to be the emperor. Civil war broke out. The Japanese took this opportunity to advance their invasion in China. Many Chinese people were unable to feed themselves during the war torn period, so migration was the only way to find a better life for themselves. The First World War broke out in 1914, Europe needed immense amount of labourers for their war effort. So, lots of sailors from Hong Kong and peasants from Wuyi were recruited to come to the United Kingdom and Europe. August, 1945, China defeated Japan at the end of the Second World War. The conflict between the Nationalists and the Communists re-ignited and soon the Communists got the upperhand. It was the beginning of the formation of The People's Republic of China. People from the Wuyi area once again decided to migrate in large number. This was partly because the following countries passed a law to stop deporting the Chinese immigrants; United States in 1943, New Zealand in 1944, Canada in 1947, and Australia in 1965. Especially in United States, the Chinese and American Chinese single male and retired soldiers were allowed to travel to China or Hong Kong to find themselves brides to bring back to the United States. Their families were also allow to emigrate to United States. This made a large increase in the Chinese immigrant population in United States. During and after the civil war between the Nationalists and the Communists, many Nationalist high ranking officers evaded the Communist government officials and gradually left China. This migration was only decreased when the borders between Hong Kong and China, and Macao and China were closed in 1952. Since the founding of The People's Republic of China, many South East Asian countries began to declare independence. They decided to limit the Chinese immigrants entering their countries. At the same time, China's political bias swayed to the left, thus decreased the chances for the people in Wuyi to migrate. This caused the increase of illegal border crossing to Hong Kong and Macao, especially during the Cultural Revolution. Most of these would leave for foreign countries via Hong Kong. In 1979, China relaxed its border control, a large number of people crossed the borders to Hong Kong and Macao to join their families, to study abroad, and for business, etc. This also included many artistic talented people. according to records, up to the year 2000, there were 420,000 people crossed the borders and set up permanent residence in Hong Kong, Macao, and abroad. Average migrants number reached over 10,000 each year. Immigrants from Wuyi and other parts of China had put up with a lot of painful experiences, both physical and emotional. The worst were around the time of the Opium War. Some were treated as slaves, while others were on unpaid contract. The Chinese called this form of recruitment of labourers "selling piglets". These people were tricked to go to Hong Kong and Macao's "piglets agencies", where they were punched and kicked into submission to sign their "contracts". When they were forcefully transported on ships, they were imprisoned in the hulls of ships, where many died. When arrived at their destination, the surviving workers were forced into hard labour and endured physical and mental abuse. Again, many did not survive the suffering or left crippled. The remaining 'lucky' ones eventually died in the foreign countries without any family. 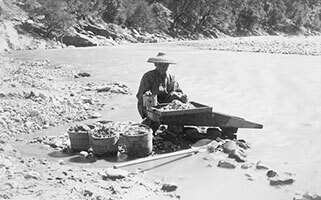 In United States, the Chinese labourers worked in gold mines in California. From 1848 to 1883, US$12billion worth of gold was mined, making up two thirds of the whole gold reserves in United States, which became one of the wealthiest nations. During the building of the Central Pacific Railway, as many as tens of thousands of Chinese workers were responsible for the most dangerous tasks. More than a thousand of them lost their lives. 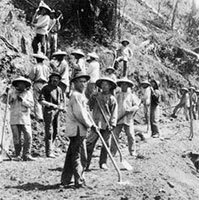 The Chinese workers also had help with the construction of the Pacific Railway and the North Pacific Railway. 1964 was the centenary of these constructions. Washington state government marked the occasion with laying a commemorative stone with bilingual inscription - Chinese and English. The Chinese immigrants also farmed around 1,800 hectare of barren land in California, turning it into arable farmland. 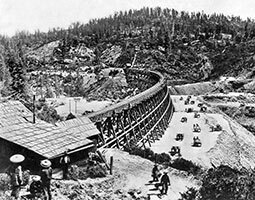 Railway construction and gold mining were two most important contributions the Chinese immigrants had made in United States, creating wealth and prosperity for the country. 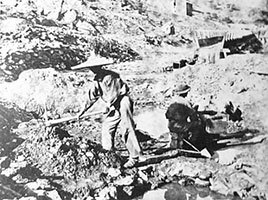 In Canada, apart from gold mining being an important contribution, the Chinese immigrant workers also help built the 3,800 miles long Pacific Railway. On 25th of September, 1982, in Yale, British Columbia, the starting point of the Pacific Railway, a copper commemorative plague was erected. Inscription was in three languages - English, French and Chinese. During the construction of this railway, amongst 10,000 Chinese workers, over 70% of them were from the Wuyi region. The number of deaths was more than 4,000. In Panama, there were more than 20,000 Chinese workers who lost their lives while constructing the Panama Canal and Panama Railway. Most of these were from the Wuyi region. During the 19th Century when Chinese immigrant workers began to arrive in Europe. The number was small in comparison with the other continents. This was because Europe developed earlier than the other continents, and with the advent of the Industrial Revolution, machines were replacing manual labour. Therefore, the labour force was sufficient for the work needed. So Chinese labourers weren't required, and also, the route between China and Europe was not straight forward. It was during the break out of the First World War when there was a shortage of manual labour for the war effort, around 230,000 Chinese labourers from north and northeast of China were recruited to go to England, France and Russia. In the early years, there were a small amount of forced labourers came from Wuyi. 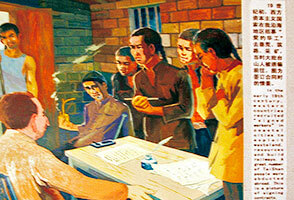 Taishan Museum exhibits some real life stories. Today, there are around 30,000 Chinese immigrants are from the Wuyi region in the UK. Around 1860, Liverpool was one of Europe's busiest seaports trading with China. One sea trade route was open between Shanghai and Liverpool. Many Chinese merchant sailors serving on British ships lost their lives in the First World War. A few thousand Chinese sailors from Shanghai, Lingboa, Shandong, Hong Kong and some from Wuyi, concentrated in Liverpool and formed a Seamen's Association. Since then, over 20,000 sailors had registered with the association. During the Second World War, unknown number of Chinese sailors died after being attacked by the German submarines in the Atlantic Ocean. 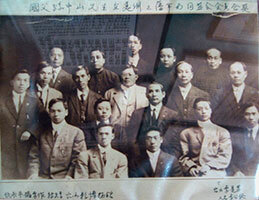 The surviving sailors could not return to China when their contracts ran out, because Japanese invaded their homeland. So they stayed in England and married the local women. After the end of the Second World War, in September 1945, the British Government ordered the forced repatriation of over one thousand Chinese sailors, leaving their wives and children in Britain. "To the Chinese Merchant Seamen who served this country well during both World Wars. In South East Asia, Chinese immigrants help with lead mining, rubber plantation, and commerce. They were all very successful. Some contribution was also made by people from Wuyi. Outside Singapore's Asian Civilisations Museum stands a statue to commemorate the Chinese immigrants contribution to the region's success. Wuyi immigrants in Australia also made important contribution to the nation's success. Apart from building the Australia's economy in the early years, they also formed associations to unite their strength, cooperate with each other, developed education system for the young, created Chinatown and a community, within which they thrived. The Chinese immigrants live in harmony with the local people, continuing with the Chinese cultural practice.